On October 9, the Enough Project hosted a reception for The Lost Boys Center for Leadership Development , or LBCLD. Based out of Phoenix, Arizona, the reception was the organization’s first event in Washington D.C., and marked its evolution from the Arizona Lost Boys Center, an organization focused on resettlement, to a new organization focused on the mission of assisting former Lost Boys and Girls to return to South Sudan and address development needs in the world’s newest country. The journey of South Sudan’s Lost Boys and Girls has never been easy. After fleeing from Sudan’s second civil war during the late 1980s and 1990s, typically making their way to refugee camps in the region, they arrived in the United States in the late 1990s and early 2000s. Even after they moved around the world to the relative safety of the United States, they faced immense challenges. The Arizona Lost Boys Center was established as a resource to provide the Lost Boys and Girls with job training, English lessons, education scholarships, and a cultural introduction to their new home. After South Sudan gained independence in July 2011, the diaspora of former Lost Boys and Girls in the U.S. began to adapt to a changing context. “They are no longer boys and girls, and they are no longer lost,” said Dr. Carlos A. Jones, president of the board of directors of LBCLD, in his introduction at the reception. The Lost Boys and Girls are now college educated adults. They are productive members of American society who face questions about those they left behind and the needs of their home country. At the reception, the audience heard from many inspiring speakers including Kuol Awan, executive director of LBCLD. To introduce Awan’s story, a short clip from BBC was shown, documenting his journey to the U.S. and his struggle with how little he knew of his past. Awan spoke passionately of the equal value placed on education and giving back to their community. A commonly used phrase among Lost Boys and Girls is, “Pioc yen e kee ama ku awa,” or, “Education is my mother and my father.” The newest initiative for LBCLD, launched at the reception, seeks to take high-achieving former Lost Boys and Girls and place them in year-long teaching assignments in primary schools throughout South Sudan. This initiative addresses two critical needs in the Lost Boy and Girl community: a concern for the future of South Sudan and a desire to return to their country. 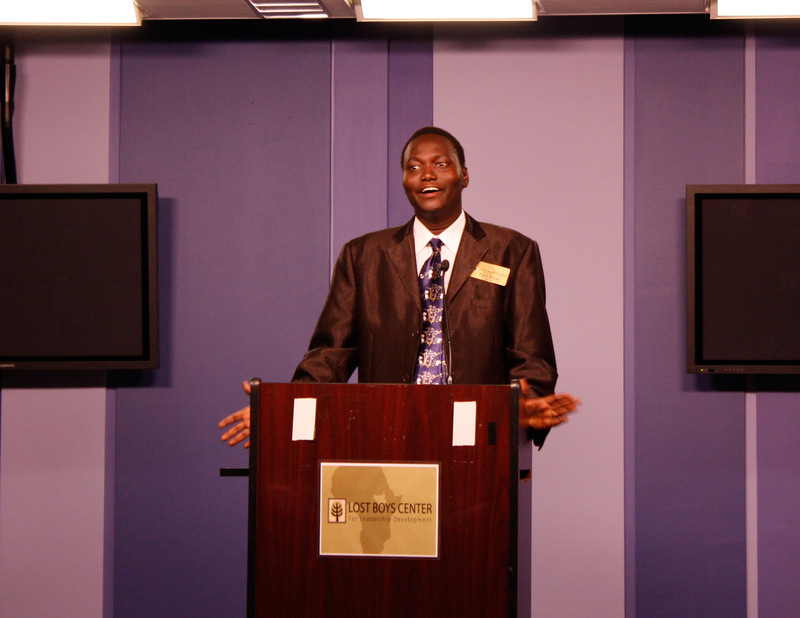 Ambassador Akec Khoc, South Sudan’s ambassador to the United States, also spoke at the event. The ambassador spoke of opportunities to leverage the Lost Boys and Girls legacy to improve South Sudan’s education system. The critical need for education in South Sudan was an important theme reflected throughout the night, especially as it affects the education of girls. According to the director of mission advancement at LBCLD, Kadi Tierney, a 13-year old girl in South Sudan is more likely to die in childbirth than to attend secondary school. In his closing remarks, Ambassador Khoc spoke about the important role of the South Sudanese Lost Boys and Girls. He said that he was the second ambassador of South Sudan to the U.S.; the Lost Boys and Girls were the first true ambassadors. The Lost Boys and Girls continue to serve their communities with a renewed sense of purpose that addresses their past and the future of the next generation of South Sudanese boys and girls.